Tornado is hands-down the best manufacturer of foosball tables in the world. They’re the most popular tables for tournaments in the US, and their quality is unparalleled. 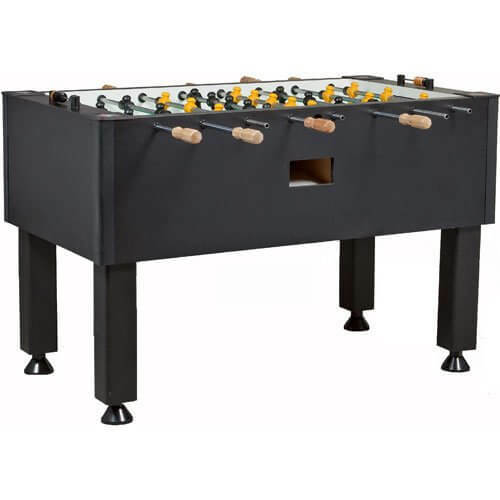 The Classic is their low-mid tier foosball table offering, one rung above the cheaper Tornado Sport, but below options like the Elite and the T-3000. But does it live up to it’s reputation…and price point? Let’s find out. This review is to help new buyers with buying one of the best foosball tables (we ranked it number 7 overall, but that’s because it’s more expensive than others…it’s quality and gameplay are all top 5, along with all of Tornado’s other offerings) that is available today. The Tornado Classic Foosball table is a replacement of the Storm II table which was available earlier. The Tornado Classic Foosball Table is among the Best Foosball Tables as it is made with heavy duty construction and at the same time is given a very contemporary look. This is due to the insane quality standards that come from Tornado. It’s a super classic, black cabinet on black legs look, which would go well in any home or office setting. The black and yellow men are classic and your eyes will never tire of the sheer quality of the workmanship. The handles are made of wood and are easy on the play experience when it comes to grip. The chrome plated rods are attractive to look at and they do not get tarnished or lose their shine. The rods are light and allow for quick movements, since they’re hollow. At the same time, they resist warping better than most hollow rods, because they’re such high quality pieces. The surface of the Tornado Classic Foosball Table is solid, since it’s an amazing 3/4 inches thick. That’s way thicker than most tables. This allows it to remain level at all times, and is much more sturdy and will last longer than most. It also allows for very fast shots to be played, which is another thing you’ll notice about Tornado tables – super fast gameplay. The foosball men are counterbalanced, which means its easy to set up an amazing long distance shot without your guys falling into the way of the ball as you shoot it. Many cheaper tables aren’t counterbalanced, which is only good for beginners and players who aren’t serious about it. As noted, they’re a classic yellow and black, and have a very square toe box for insane control and amazing shot power. The table is levelled easily thanks to the leg levers. The adjustable levers themselves have a large footprint, unlike some other tables out there. Since they’re large, it becomes very hard to move the table, so you’re getting an even, level, and secure playing surface. The cabinet is 1 ½ inch thick and it has a laminate finish. This is insanely thick by foosball table standards. The logo on the field is three colored and is ¾ inch in size, laminated as well. The construction of the entire table allows for greater durability as well as for added rigidity. This is one of the only Made in America tables on the market, and the craftsmanship shows. The foosballs themselves are amazing, made of patented designs, and made of urethane. These prevent chipping and nicking. They also roll better and give you unprecedented control. We looked at a TON of tables out there, and honestly we included every single Tornado table in our list of the top 15 tables. The only reason they didn’t come out 1-5 was because the price is quite steep on all of them…even the entry level ones without counterbalanced men. However, the Classic is a good mid-range option that, while expensive, has all the tournament features you want and is an insanely fun table. Highly, highly recommended if you’re serious about your table soccer experience.